“Erected By the People for the Use of the People,” the New Britain Museum of American Art is dedicated to serving all people by pursuing excellence in art through collections, exhibitions, and education. The New Britain Museum of American Art‘s founding in 1903 entitles the institution to be designated the first museum of strictly American art in the country. That year, a $20,000 gift of gold bonds to the museum’s former parent, the New Britain Institute, from industrialist John Butler Talcott, created funds to purchase “modern oil paintings.” Subsequent purchases, with advice from New York museums and galleries, further defined “modern” to mean American works of art, now numbering more than 10,236. With particular strengths in colonial portraiture, the Hudson River School, American Impressionism, and the Ash Can School, not to mention the important mural series The Arts of Life in America by Thomas Hart Benton, the museum relies heavily on its permanent collection for exhibitions and programming, yet also displays a significant number of borrowed shows and work by emerging artists. The singular focus on American art and its panoramic view of American artistic achievement make the New Britain Museum of American Art a significant teaching resource available to the local, regional, and national public. 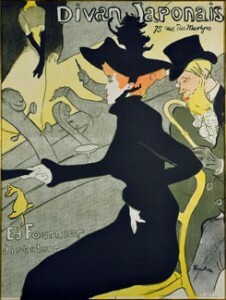 For the first time out of Europe, Toulouse-Lautrec & His World begins its U.S. tour here before moving on to Allentown Art Museum in Allentown, PA. Henri de Toulouse-Lautrec lived in Paris during the Belle Époque (Beautiful Era) frequenting cabarets and cafés where he captured its famous singers, actors, his friends and the working class in his highly celebrated posters, prints, caricatures, sketches, and paintings. Greatly influenced by the French Impressionist movement, Henri de Toulouse-Lautrec is a post-impressionist of the mid-late 1800’s. Due to his excessive lifestyle Henri de Toulouse-Lautrec died from complications of alcoholism and syphilis in 1901 at age 36. The piece that really struck me was: “The Cycle of Terror and Tragedy: September 11, 2001” by Graydon Parrish. In this painting , reading left to right we can see children on the far left, youth in the center and old age on the right but there is also a child to the far right linking the right side with the left. This indicates the cycle of life. The children also represent Innocence. The figures of Innocence flank Terror and Tragedy, the two standing figures. Innocence is obliterated in the face of Terror and Tragedy but the child on the far right signifies a return of innocence. The three children on the left are blindfolded. They maintain their innocence because they cannot see what is happening. They are also playing with toy airplanes. Here, the artist chooses to depict the planes as toys rather than weapons. The third child from the left is part of the family present in the painting, representing all the families affected by the tragedy. His father is just to the right of him, dying, and his mother is part of the group of mourning women. The two central figures are youthful, representing “humanity at the prime of life.” They are nearly identical and are representative of the two World Trade Center towers. The forms look poised for motion, on the balls of their feet but are balancing precariously, indicating they may topple over at any moment. Farther to the right, the three mourning women are similar to the three fates of Greek mythology. They are all-knowing and tragic therefore they are portrayed without blindfolds. They are not innocent because of their knowledge. The middle figure is the mother of the family. The colors of the painting are also striking in their simplicity and clarity. Besides the purple used sparingly, the main color scheme is red, white, and blue. The roses are another image that was broadcast into millions of homes. As New Yorkers placed the flowers all over the city to remember loved ones, the artist has done the same over the bits of paper on his allegorical island. It is necessary to consider the symbolism utilized in the placement of the figures, the color, the setting. The apparent contradiction of painting something tragic in a beautiful way engages the viewer so they will consider an in-depth assessment. By peeling away the layers, the artist’s true intentions become apparent and viewers can appreciate the attention to detail. The classical painting style, combined with modern day images and wrapped in symbolism. Very intriguing to me!